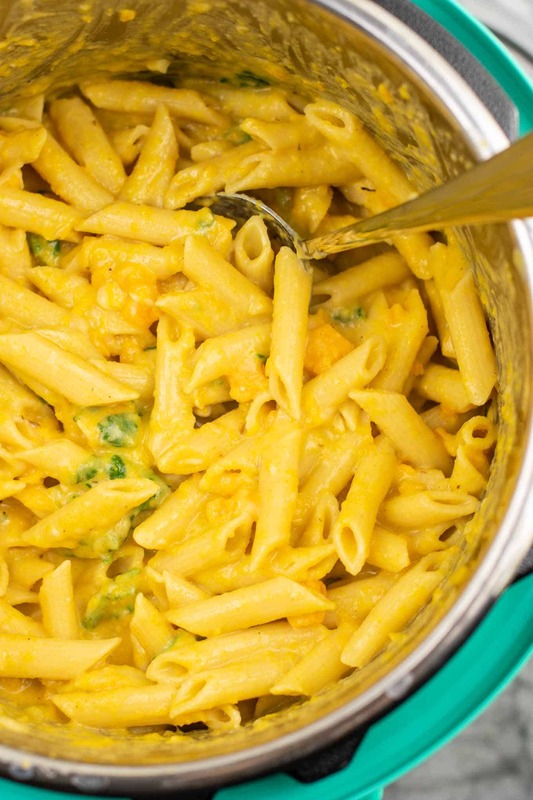 This instant pot creamy sweet potato pasta is one of my favorite fall dinners! 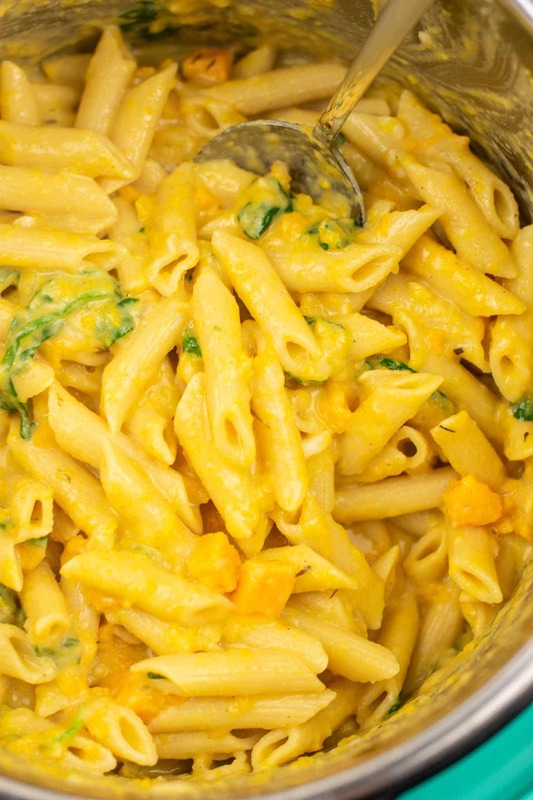 Penne drowned in a rich parmesan cream sauce, with sweet potatoes and spinach for added veggies. 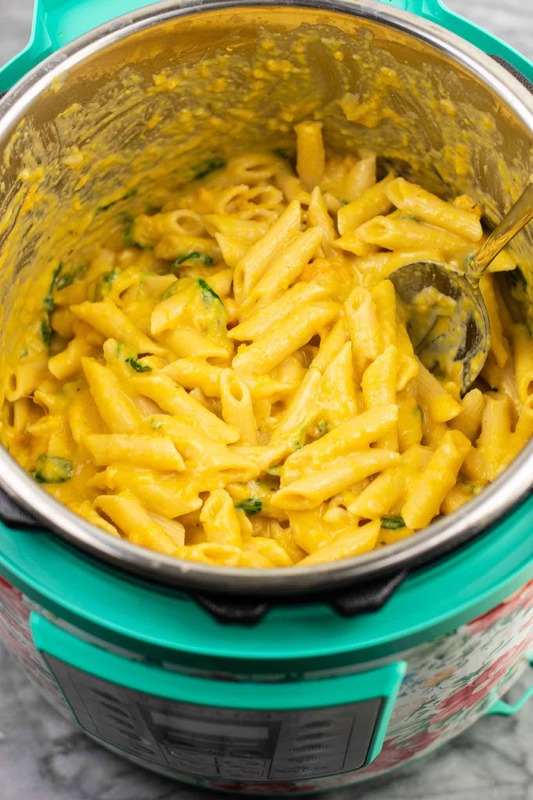 This recipe is almost exactly the same as my One Pot Sweet Potato and Spinach Pasta which has long been a favorite in our house! I have adapted the recipe for instant pot lovers and it’s even simpler than the stovetop version! This pasta has a super thick and creamy sauce and so much flavor thanks to one of my favorite pasta additions – freshly grated parmesan cheese. Buy a block of parmesan at your grocery store and grate it yourself, that is key for this recipe. If you have never had freshly grated parmesan before, you will be shocked at the difference! I’m all for grating your own cheese anyway, but parmesan especially is nowhere near as flavorful when bought pre shredded. It only takes a few minutes to grate it yourself and is well worth the effort. Keep reading for the step by step instructions, and at the bottom of the page you will find the full printable recipe! First, you will peel and dice up 1 large sweet potato into chunks. If you want your sweet potato to stay in chunks, cut it into larger pieces. For me, I chopped mine into small pieces and it softened to become part of the sauce. You will also need 1 medium onion, diced, and 10 cloves of minced garlic. Don’t be afraid of the garlic and onion, as they are the base for all things delicious! 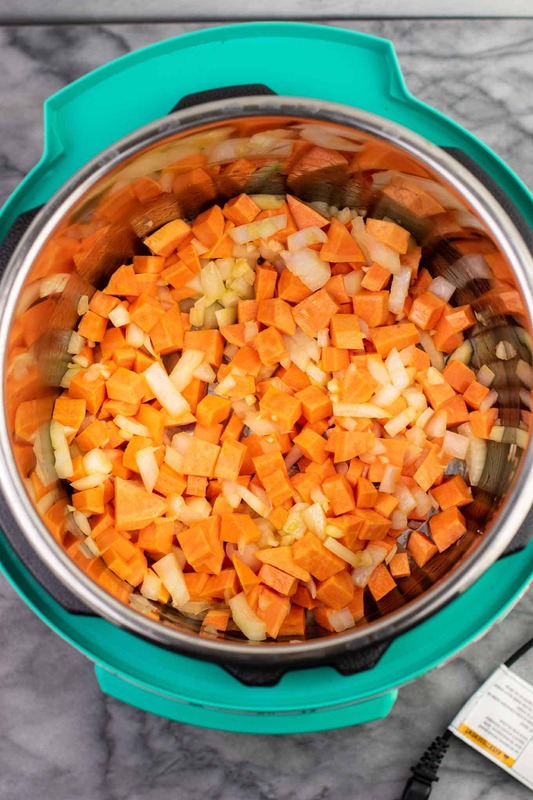 Add your sweet potato, garlic, onion, and olive oil to your instant pot. Turn the instant pot to Saute and cook your veggies for 7 – 10 minutes, until the sweet potato starts to soften. Stir often to avoid burning. Once this step is done, turn the instant pot to OFF. Add your penne, sage, thyme, vegetable broth, and water to the pot and stir well. 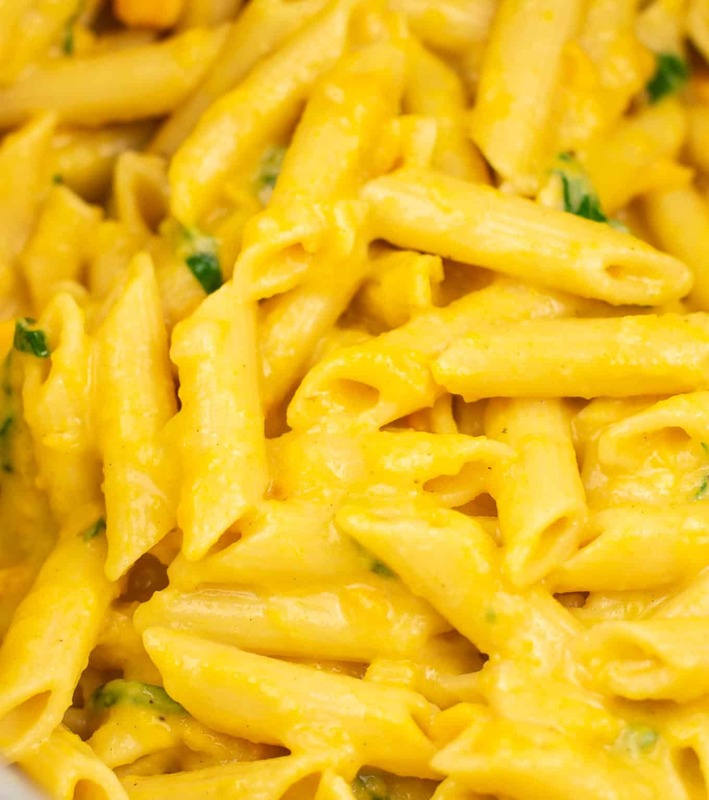 Make sure the penne is well immersed in the liquid. Turn the instant pot to manual, seal, and set the timer for 5 minutes. Once the pot comes to pressure (this may take a few minutes), it will cook in just 5 minutes! This allows for al dente pasta, any longer would result in mushy noodles. Once your pasta has cooked, do a quick release. After the pin has dropped, safely remove the top. Stir in your freshly grated parmesan, heavy cream, and stir. Give it a few minutes to thicken and keep stirring, then salt and pepper to taste! 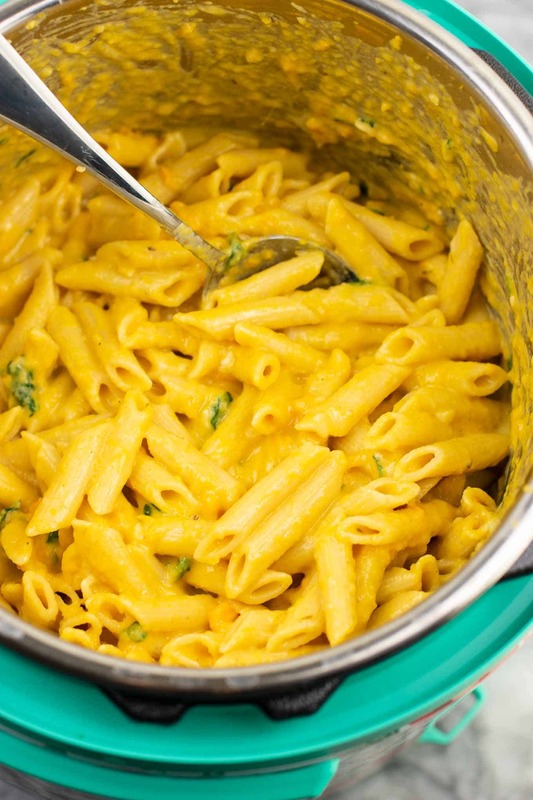 The longer it sits, the more it will thicken, and the sauce will still be super creamy. Toss in your spinach until wilted and you’re ready to serve! I serve mine topped with more parmesan for flavor. My toddler absolutely gobbled this one up! If you have picky kids they may love this recipe. I loved that he was eating sweet potatoes and spinach and didn’t even seem to notice. 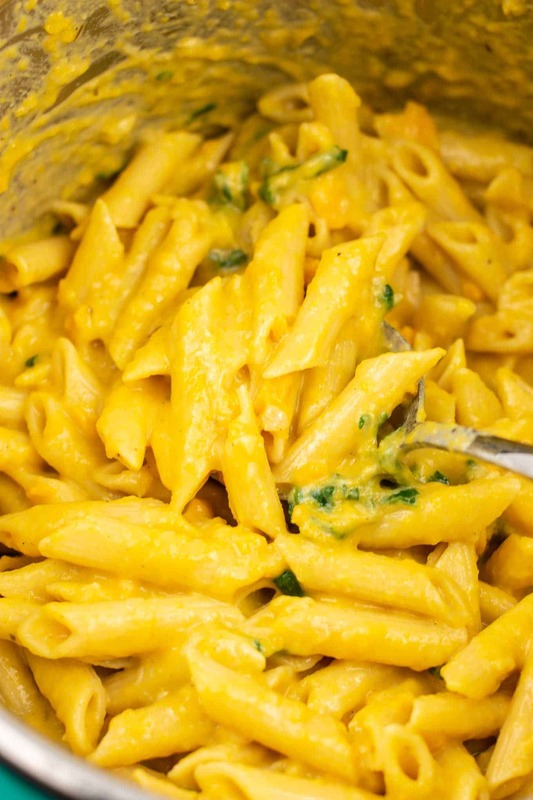 The parmesan cream sauce makes it taste like a fancy restaurant pasta! I hope you’ll try this easy and delicious recipe. It’s a winner for me when I can make a dinner that both the adults and the kids will eat. 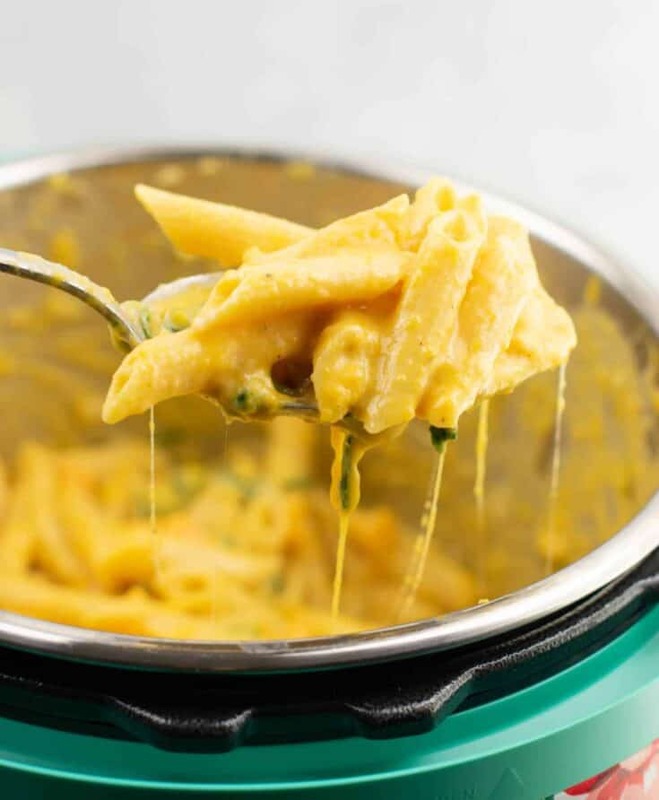 Check out our favorite instant pot mac and cheese recipe! Did you make this recipe? I want to see! Don’t forget to tag us on instagram @buildyourbite and hashtag #buildyourbite with your recipe photos! Be sure to follow Build Your Bite on Pinterest for all the latest delicious vegan and vegetarian recipes! 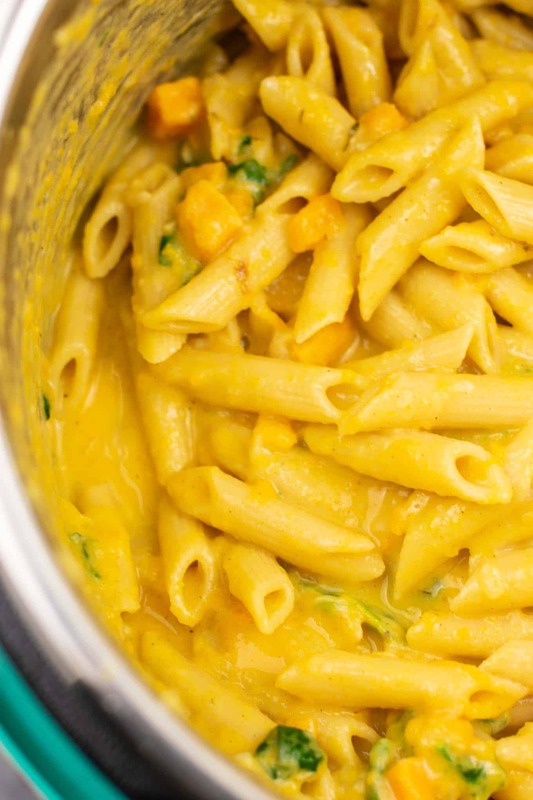 Vegetarian instant pot creamy sweet potato pasta in a parmesan cream sauce. Saute for 7 - 10 minutes, stirring to avoid burning, until sweet potato begins to soften. If you want your sweet potato to stay intact, cook less time. I cooked mine longer so that it would fall apart and become part of the sauce once cooked. Once the instant pot comes to pressure, it will count down the five minutes. We love this recipe! it’s a staple in our house.